A few weeks ago the bf and I were bored at home and decided to go out somewhere for dinner. Since the economy has been kinda rough on our pockets we decided to try somewhere affordable. We received a local magazine with coupons for restaurants, dry cleaners, etc, and decided to get Indian food since it had been so long. India Grill is located in Richie Center off Rockville Pike. The closest metro stop would be Rockville on the red line. Since it is in a shopping center there is ample parking, however there are many other restaurants there, so parking can become a bit difficult around dinner time. There's glass surrounding 2 of the 4 walls, so it has a nice open feel. You can see the mini-white fence on the right side, which is an ourdoor patio for dining during nice weather. What I thought was cool was that there was a glass window into the kitchen so you could see people cooking. Personally I like watching people cook, which is why I can watch food network all day long and not get bored. This is the dining area which was very packed during dinner time. You are seeing all of the tables in the restaurant, so it is a cozy place. Random, but while we were there a small group of Christmas Carollers came in to sing, which is why there are people standing up in my photo. When I first walked into the restaurant the aroma of the food was heavenly. If a place smells good there's a very low chance that the food will be horrible. India Grill offers a regular menu as well as a dinner buffet. We originally were going to order off the menu, but decided on the buffet for the variety and cost. We both paid $11.99 for buffet, but if you were to only get the vegetarian dishes it would be $9.99. The buffet had around 15 different items. This being my first buffet post, I realize that it's not easy writing about every single item because that'd take forever! So I'm going to post all of the pictures I took, but will comment on those dishes that I found most memorable. The buffet was very clean, restocked contantly, and smelled great. Sorry my camera was making the food blurry! It didn't know where to focus, but I figured its better to be able to read the description and remember the color of the dish because that's how I kept track of what I was eating. The potatoes were very tender in the sauce, and the tomato based curry had gret flavor. This was another favorite of mine. The broccoli wasn't overcooked, and the sauce was just yummy. I enjoyed trying the dishes with both the rice and Naan, and really they both taste great. At some Indian restaurants I'm not a huge fan of their rice so I eat everything with their Naan, but I didn't have a problem at this restaurant. One of the few meat items on the buffet. The Mint Coriander sauce was so good. It had a nice tangy and fresh taste. I liked to put it on everything. Onto the dessert type dishes! The rice pudding was good and sweet. The Gulab Jamun were REALLY good. They were basically donuts in a honey-tasting syrup. Here's what the tandoori chicked looked like. I didn't get a chance or try any, but my bf said it was a bit dry. The bf's full plate! He likes to make the most out of a buffet. I on the other hand can't eat that much, but I do like to taste a lot of things. I don't know why I put the Gulab Jamun on my plate but I wanted to try it ASAP. As you can tell, I put the Mint and Coriander sauce on everything. The restaurant was kind enough to give us some 'Saag Paneer' which is cubes of homemade cheese cooked with spinach, spices and herbs. I loved it. The spinach was very mild for those who don't like that kind of flavor, and the cheese complimented the dish with it's texture and mild flavor as well. The spices was what gave the dish great flavor. I had a great expirience at India Grill. I noticed that the place has a lot of regulars because the manager was speaking to everyone like he had known them for years. It was a pleasure to meet the manager Mr. Luis Gomez, and if you all have been following my blog, you know that good service is a MUST in my book. 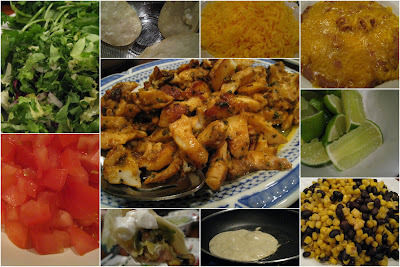 The food was flavorful and afforable, and there was much variety. I'd recommend this place for a casual night out in a cozy room that smells wonderful. Here is the monthly magazine I found India Grill in. We were going to use one of the coupons but decided on the buffet at the last minute and it can't be used on any buffets. Hi everyone! It's always hectic around the holidays, so my apoligizes on not posting recently. I'm working on my India Grill post, so it should be up this week. Christmas was spent at my bf's parents' house during the day and then at my aunt's house for dinner. It was funny because we just got carry-out for dinner this year, haha. The holidays is a time to just spend with family, and that's the most important thing. The New Year is quickly approaching and so is my bday...eeek. So once again, sorry for the lack of posts, things should be dying down soon, talk to you all soon! Recently the bf and I celebrated our 4 year anniversary. I can't even believe it's been so long! We met in college during our junior year and now live together with our dog Riley. For our anniversary dinner I decided to go to Mie N Yu because all of my friends raved about how cute the place was. Once again, let me apologize in advance for the blinding use of flash on the food because it was so dim in there. The mood lighting is great for dates but not blogs! Mie N Yu's theme is the the Silk Road (historic trade route), so the rooms and cuisine reflect Asian, Middle Eastern, North African and Mediterranean traditions. 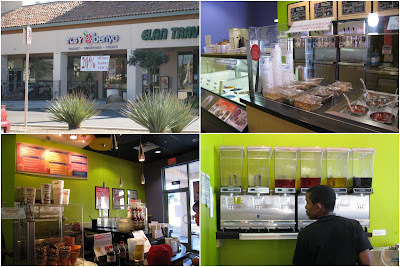 It is located on M Street in the heart of Georgetown. Similar to Paolo's in Georgetown, one would either have to drive or take the metro to Foggy Bottom on the Blue/Orange line and take a bus. Parking can be a bit difficult to find especially on the weekends, but as long as you don't mind parallel parking or walking a couple blocks, then you should be fine. The restaurant is right next door to Urban Outfitters. Let me focus on the ambiance for a second. It's so cool in there! It's funny because I've passed by the restaurant so many times before and didn't realize what it was because you can't see past the waterfall-filled windows. The first/main room you hit is 'Moroccan Bazaar'. Everything is made of wood, and there are drapes covering some tables, and pillows adorning others. What I thought was unique was that some of the tables were elevated like a few feet above the floor. So it gave the place a cool feel. It also helps with privacy because essentially they're fancy booths. This is a view from our high table which the bf reserved for our special occasion (aww how thoughtful, haha). It has comfortable pillows and the drapes make you feel like you're outside. I know you all might think this is strange, but I tried to take a picture of the bathroom because it was cool. There are around 8 stalls that have doors from floor to ceiling and men and women share them. Then in the center of the room there are a couple Zen-looking sinks with rocks in them. The wall has floor to ceiling mirrors that make the room look huge. There is also a bathroom attendant that turns the water on for you, puts soap in your hand and gives you a towel. It was really nice, however that kind of prevented me from taking a ton of pictures since he was kind of always next to me. This was our table! The chairs were comfy, I liked the drapes because it felt like we were eating outside. I thought it was a nice size for 2 people, but it might be a bit cramped for 4. Alright onto the food! For our starter we ordered the 'Smoked Salmon Bruschetta - pastrami rubbed smoked salmon, Vermont goat feta, bell pepper, tomato, onion, toasted baguette' for $7. I loved it. They gave us so much salmon and the balance of flavors with the veggies was great. It tasted very fresh. For my main course I ordered the 'Miso Hanger Steak - American natural beef, Japanese ratatouille, ginger teriyaki glaze' for $26. The beef was very flavorful and salty. It was tender and was a good portion for me. The ratatouille part (underneath the steak) was a bit oily. The bf ordered the 'Miso Pekin Duck - Pennsylvania natural duck breast, yuzu braised bok choy, organic bamboo fried rice' for $24. We both wanted to get this dish since we love duck, but decided that one of us should get something different so we could try different dishes. I loved his dish. The duck wasn't gamey and was cooked perfectly. The bamboo fried rice complemented the saltiness of the duck. Onto dessert! We decided on the 'Buddha’s Delight - chocolate lava cake, chai latte creme, crispy strawberry ravioli' for $16. It was so good! Very rich chocolate cake with melted fudge in the center. The Chai latte creme was a great dipping sauce for the ravioli and cake. We finished the entire thing even after being stuffed from the other food. Sorry the pic isn't so great but we didn't really get around to asking the waiter for a picture. Our server was really nice and told us to check out the rest of the place when we got a chance. They have around 8 themed rooms on 2 floors. The other ones are opened on the weekends though. This is the 1st room up the stairs called the 'Venetian Room.' It's mainly a bar with small tables. This is the only one is the restaurant and its called the 'Bird Cage.' It is hovering over the room below, and is reserved especially for the Chef's Tasting Menu. It can accommodate up to 7 people for a 4-6 course tasting for $95 per person. This is the 'Baroque Room' and it is also on the 2nd floor. The chairs are made of strange pieces of wood and makes me feel like a Viking feast should be taking place in there. Back downstairs is the 'Hong Kong Bar.' They have a SUPER EXTENSIVE alcohol list. They really have everything you could possibly want. I just liked the cool lighting. Right next to it was the 'Turkish Tent' which was a bright and comfy-looking room. Right next to it was the 'Tibetan Lounge' which was roped off so I couldn't really see it. Overall I thought the place was cute, and romantic for an anniversary dinner because you do have a bit more privacy to talk and the lighting is low. The themed rooms really makes this place stand out if you want to experience something unique. The wait staff is friendly, but beware that they can be slow. Dinner took 2.5 hours of mostly waiting around. The meals are delicious, but expensive. The most expensive thing on the menu other than the Chef Tasting would be the 'Wild “Inside - Out” Flounder' for two people to share at $69. Oh how I LOVE being on vacation during the holidays. I don't have to work, I get to be with my family and I get to eat ALL THE TIME. 2nd night there my sister-in-law made fish tacos for us with seasoned tilapia. It was really good cuz the fish didn't taste like fish. I love having a lot of fixens to put on my tacos so we had normal stuff like diced tomatoes, sour cream, homemade gaucamole (my fav), black beans/corn, shredded chedder cheese, refried beans with cheese, lime and lettuce/cilantro. My sister-in-law used corn tortillas and gently pan fried them in oil to get them warm and soft. I thought that was a great idea because I usually use flour tortillas and microwave them. 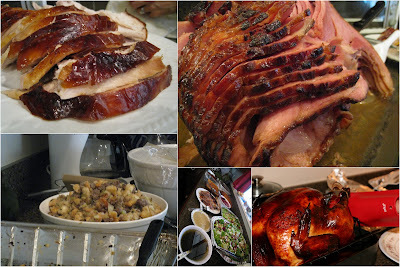 3rd night my mom went to Costco to get stuff for Thanksgiving. She ended up getting food for dinner that night too so no one would have to cook. 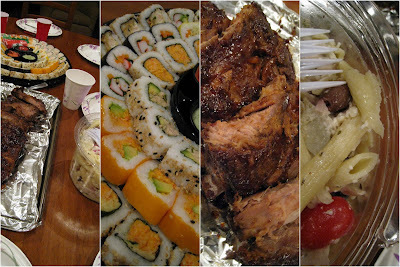 We had BBQ ribs, a sushi platter and pasta salad with chicken. The ribs were tender and had a nice sauce. The sushi wasn't great since none of it was raw, and the rice was kinda mushy. However the pasta salad was really flavorful and came with a sort of ceaser dressing. Here are only some of the desserts like sour cream raisin pie with merengue, pumpkin pie, apple pie, toffee walnuts, fruit (Asian people always have sliced fruit for dessert), pecan pie (Safeway brand, don't buy it cuz it was bad), and this Vietnamese spongey-cake-geletin thing called 'Banh Bo', which literally means Crawling Cake cuz its jiggley. It tastes like coconut. That same night I went to another relative's house for another Thanksgiving and this one had less traditional food and more Vietnamese food. Like a Vietnamese salad, egg rolls, mushroom soup, etc. I had some of their turkey that had bacon on it and that was good. 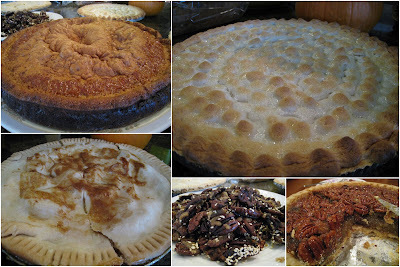 I didn't eat much else cuz I was stuffed from the previous meal, but I did eat some dessert. 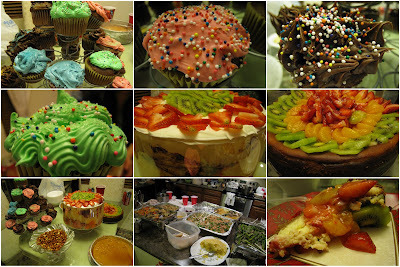 There was home made cheesecake, cupcakes, cake with Jello and whipped cream, and flan. I had a slice of cheesecake cuz I wasn't able to eat dessert at the other house. It was really good with fruit on top. 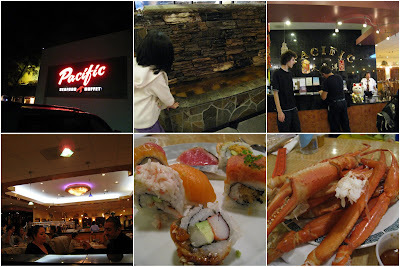 On Black Friday we went to Pacific Seafood Buffet, which is really a Chinese buffet with lots of seafood. It was a really good buffet with an awesome sushi bar, Alaskan Crab legs, green tea ice cream, and all of the other normal dishes for only $14 a head. I had 3 scoops of ice cream and a ton of crab legs and sushi. On the weekend some new friends and family met at my mom's house for some Vietnamese and American food. 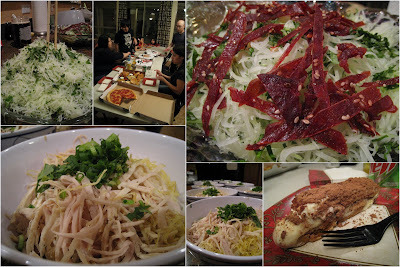 We got Pizza Hut's Pizza Mias, some appetizers from a local Italian place, green papaya salad with Vietnamese beef jerky, and a noodle soup with chicken, egg and Vietnamese Spam called 'Bun Thang'. It was actually really fun meeting new people and sitting at the 'Under 40' table because if you're not a parent of grown children or grand parent then you sit at the kids table. Since I did a review on YogiBerry, I decided I wanted to try a different frozen yogurt place out there called TCBY/Beriyo. They seemed to have a lot more smoothie options than toppings to personalize one's dessert cup. They did offer cones, and did have other options that didn't come out of a soft serve machine. I liked it because they had a lot of cool smoothie options, and I ended up getting a blend of pineapple, strawberry and banana. On Sunday my mom taught my cousin and I how to make 'Ca Kho To' which is Vietnamese Caramelized Fish. It's usually made with catfish, but you can really make this sauce for any sort of meat. 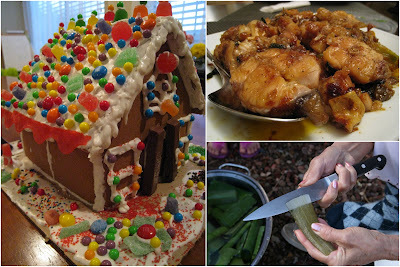 Earlier in the day we made a Gingerbread house with the kids and just used a kit that came with the gingerbread, icing mix and candy. It was really fun and it looked great in the end. Random, but Thanksgiving morning my sister-in-laws family went into their backyard and got some aloe plant to mix into a strawberry/banana smoothie. It was really good, and it's healthy for you. I think it's so cool that they can grow stuff like that in their back yard cuz over here in MD, it'd die cuz it would be too cold. 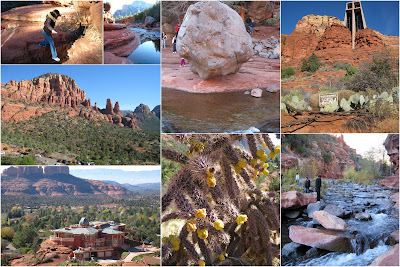 Besides food, I got to go with my family to Sedona, which is about 2 hrs north of Phoenix. It's a really beautiful city with red rock mountains. We did a little hiking (the upper left pic shows me leaping to my death! haha jk), photography, and ate sandwiches from an eatery in town. 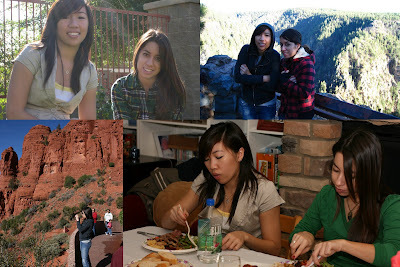 I had a great time chowing down, photographing beautiful scenery, being in such nice weather, and being around my family. Hope you guys had a nice Turkey Day too!